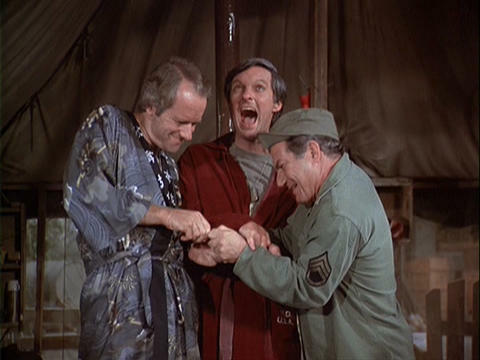 TODAY WE COVER Season 6 Episode 17 "Patent 4077"
PLOT SUMMARY: Margaret finds out who her friends really are when Klinger accidentally throws out her wedding ring from Donald with the 4077 trash. Hawkeye and BJ are frustrated when they are trying to perform an arterial transplant, but they do not have a vascular clamp small enough to control an artery without crushing it. Colonel Potter suggests they talk to the U.S. Army, Corps of Engineers, but they are not available; neither the good doctors nor Private Zale can build a clamp that works. So, Hawkeye and BJ find a jack of all trades: a master craftsman who can make it.